DEPs diversified business portfolio, steady growth, and distinctive position & recognition for value has led Talent Acquisition to emerge as a key business unit. DEPs innovative business models enable our clients to meet the current challenge of a dearth of experienced engineers. Our onsite engineering support group provides trained graduates and experienced engineers to our clients with a variety of skill sets in CAE, Product Design & Engineering, General engineering and IT. 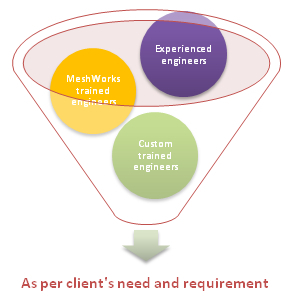 DEP can also provide MeshWorks trained engineers, who have an added skill set of morphing, parameterization and optimization using MeshWorks. In addition, we can also train engineers as per the client’s requirements. We are a direct vendor to several global OEMs. We are experienced in providing engineering staffing globally across all industries, whether Automotive, aerospace or defense, biomedical, oil and gas, shipping, or heavy engineering.